Few can give with the generosity and creativity of bighearted psychopath Serge Storms. Like Santa, Serge knows who’s been naughty and who’s been nice. As December 24 rolls around, he is to be found filling up the Serge sleigh with an unforgettable bag of presents. Dorsey offers the perfect antidote for all those sappy feel-good holiday stories with this zany blockbuster extravaganza in which his wonderfully deranged local historian-serial killer delivers his special brand of Christmas cheer. More outrageous than Santa Claus in a Speedo, When Elves Attack serves up a Yuletide feast of the “pure gonzo humor” the New York Times Book Review enthusiastically attributes to this fearlessly funny writer. 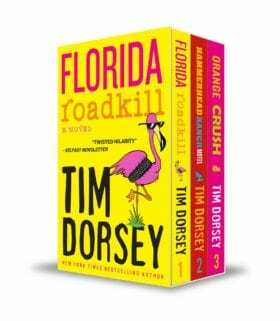 Welcome to Tim Dorsey’s slice of America – where nobody gets out unscathed and un-Santa-Claused!